Women’s Olympic Downhill: It’s On! 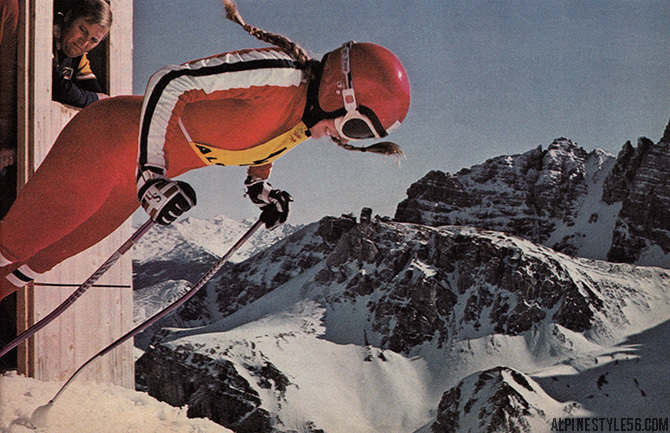 In a setting of grandeur, pigtailed Cindy Nelson thrusts out over the downhill course on which she won a prized bronze medal for the U.S. From Sports Illustrated coverage of the 1976 Winter Olympics in Innsbruck, Austria. Up late to watch the women’s downhill live from Sochi. Rooting for Julia Mancuso all the way! 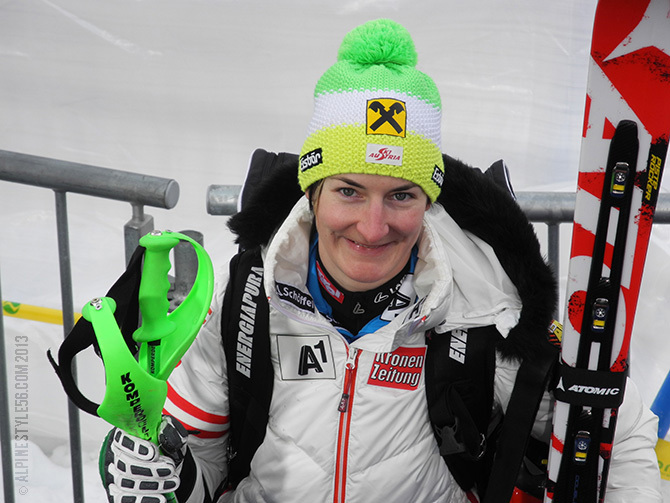 I think my dream podium would be: Mancuso gold, Maria Hoefl-Riesch silver, Anna Fenninger bronze. Lindsey Vonn will be missed, of course. Very, very sad for Tina Weirather, out with a leg injury incurred in training a few days ago – she deserves to continue her winning season. 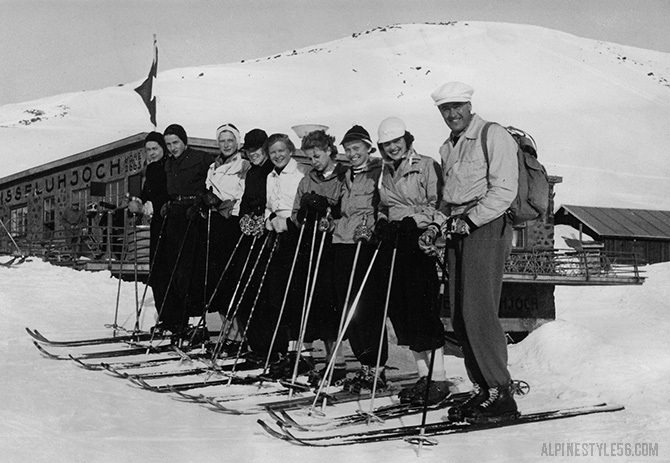 Alpine skiing debuted at 1936 Winter Olympics in Garmisch-Partenkirchen, Germany with a single event – the Combined comprised of downhill and slalom. The 2014 Winter Olympics in Sochi, Russia will feature five alpine ski events for each gender: Downhill, Super-G, Giant Slalom, Slalom and Super Combined. Congratulations to the team of women who will be representing USA: Stacey Cook, Julia Ford, Julia Mancuso, Megan McJames, Laurenne Ross, Mikeala Shiffrin, Leanne Smith, Resi Stiegler, Jacqueline Wiles. 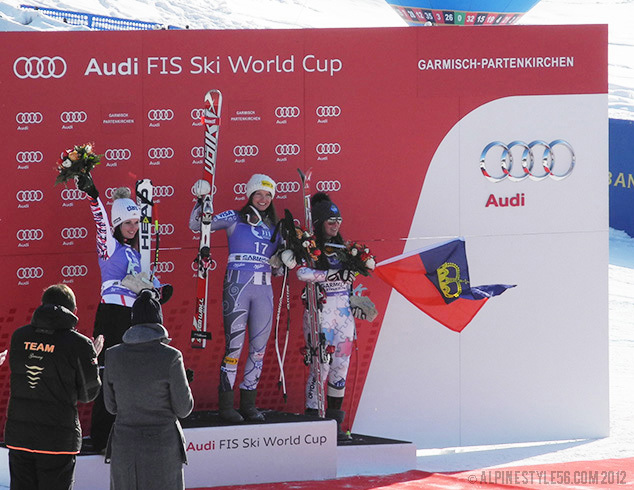 Lindsey Vonn and Alice McKennis will be missed! 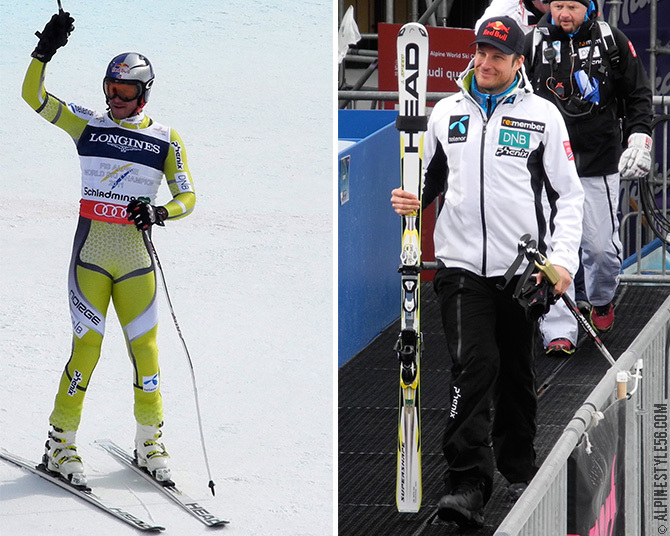 NORWAY: Aksel Lund Svindal filling out his vibrant yellow speed suit and clean white and black outerwear by Phenix. 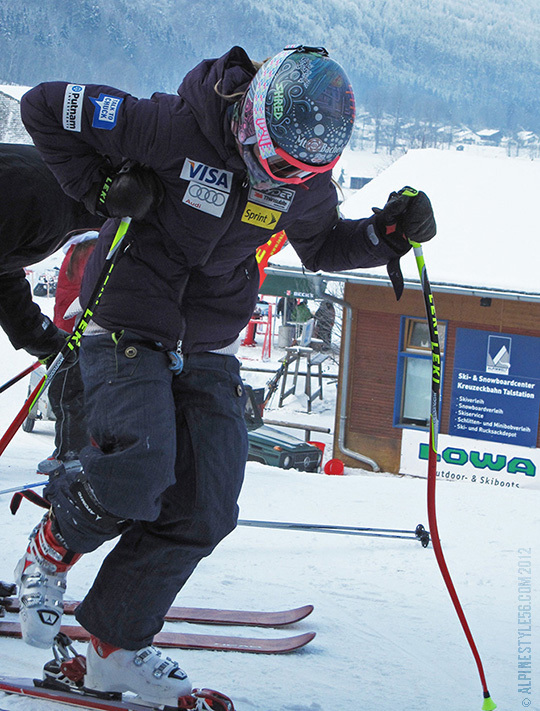 UNITED STATES: Julia Mancuso in black, Laurenne Ross in vivid green, uniforms by Spyder. The green was kind of fun but I am hoping new uniforms have a more patriotic look. I do have to give the USST and Spyder a nod for infusing inherently uptight uniforms with a sense of relaxed American mountain lifestyle. 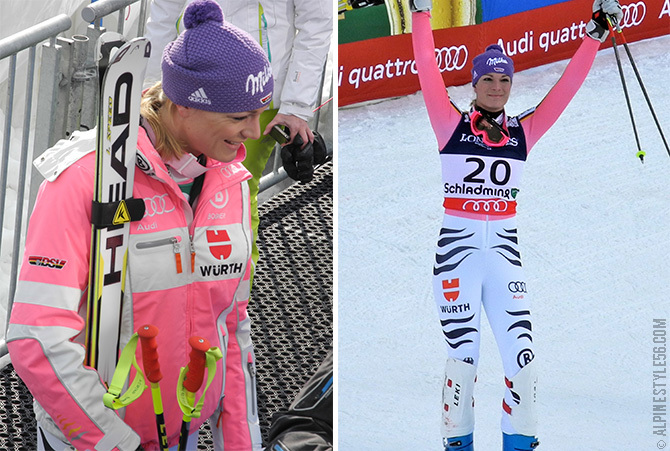 GERMANY: Maria Hoefl-Riesch wears Bogner vivid pink outerwear and the snow tiger suit which is a long-standing tradition for the team. 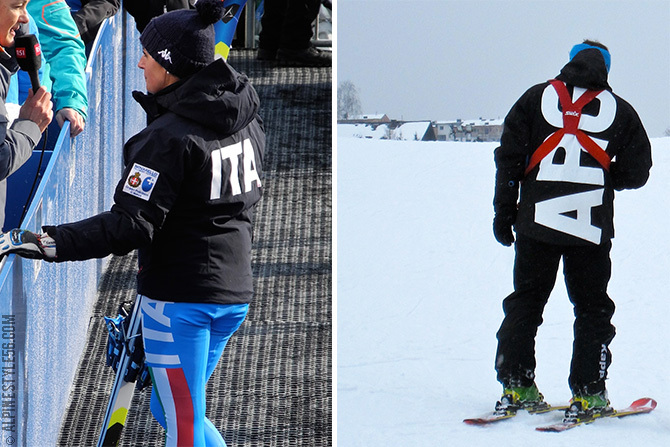 ITALY, ARGENTINA: Bold letters in black and white clearly identify these teams in uniforms by Kappa. 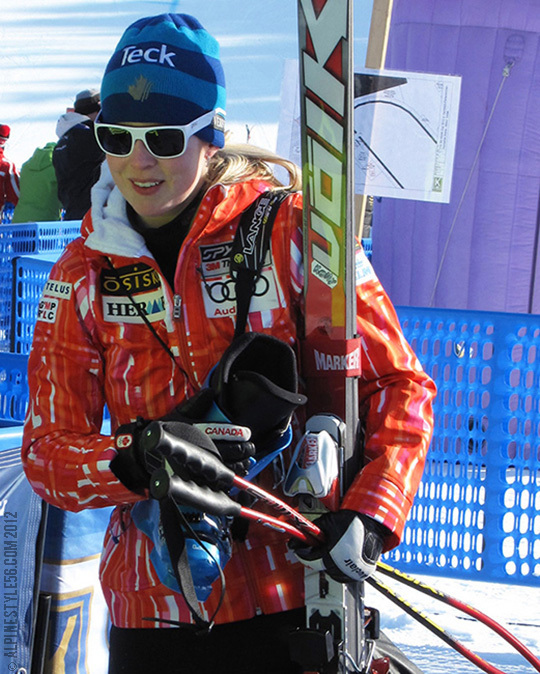 Nadia Fanchini of Italy at left. I quite like the graphic impact and utility of this strong look, especially Argentina’s stylized execution. SLOVENIA: It’s a good thing World Champion Tina Maze carries herself with such presence because this uniform by Halti is a lot to pull off. 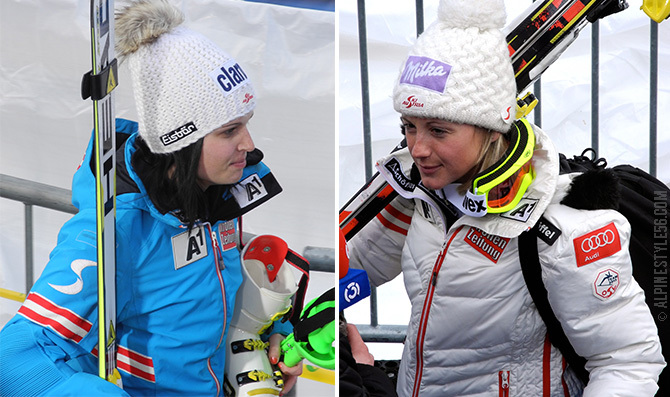 AUSTRIA: Anna Fenninger in bright blue, Michaela Kirchgasser in white, outerwear by Schöffel. The Austrian kit, like the team itself, is very strong and a contender for the best – distinctive and refined, powerful and wearable colors, complementary variety, consistent interesting themes and details, well merchandised and executed. The back of the blue jacket is emblazoned with the claim Power Team, true enough! Puffy Jackets: Hannes Reichelt of Team Austria in black Schöffel. 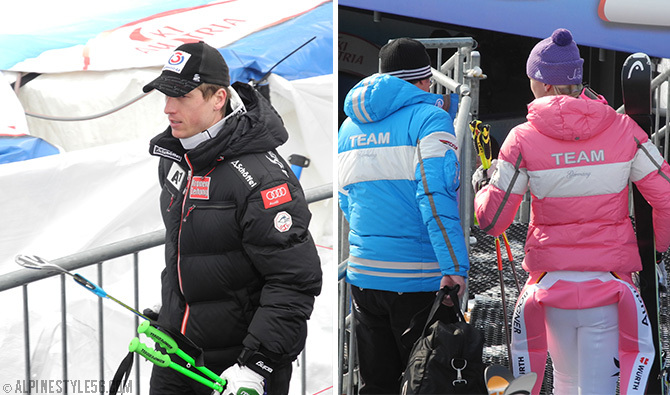 Bogner male and female versions of team insulated outerwear; Maria Hoefl-Riesch again in pink. 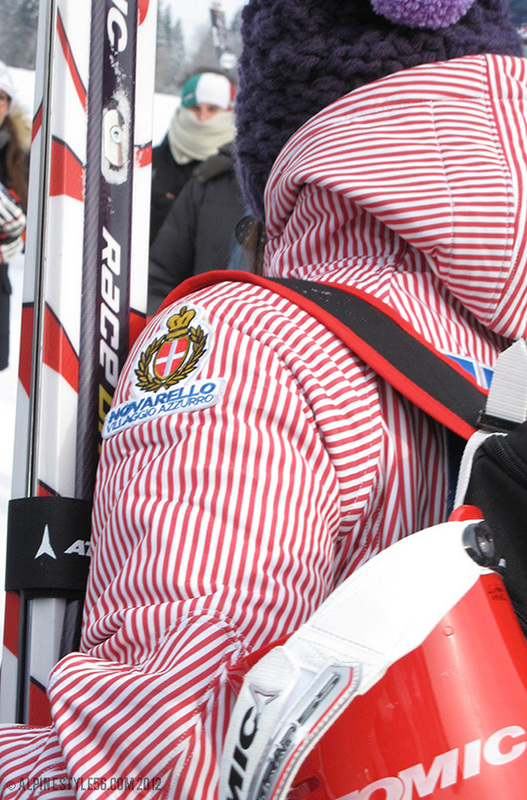 With the Sölden FIS World Cup ski races kicking off the new season in just a few days, here is one last peek at some national team uniforms from 2013. I am always curious to see if and how much teams change their kits year to year. From early season training photos, I have seen a little new but much of the same from last season. With 2014 being an Olympic year, there will be no shortage of new uniforms to be revealed! JC de Castelbajac for Rossignol as seen at ISPO, January 2012. 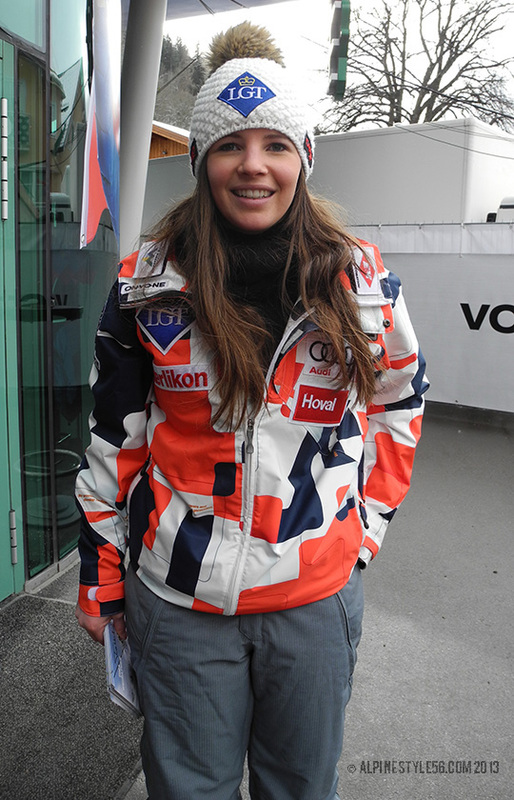 Julia Mancuso after her 5th place finish in the Women’s Downhill at the 2013 Alpine World Championships in Schladming, Austria. On Julia: USST jacket by Spyder and Houdini Sleepwalker down skirt. On her: JC de Castelbajac Clemence Down TG Jacket, Geny PR Pant. On him: JC de Castelbajac Snowtiger Jacket, Snowtiger Pant. 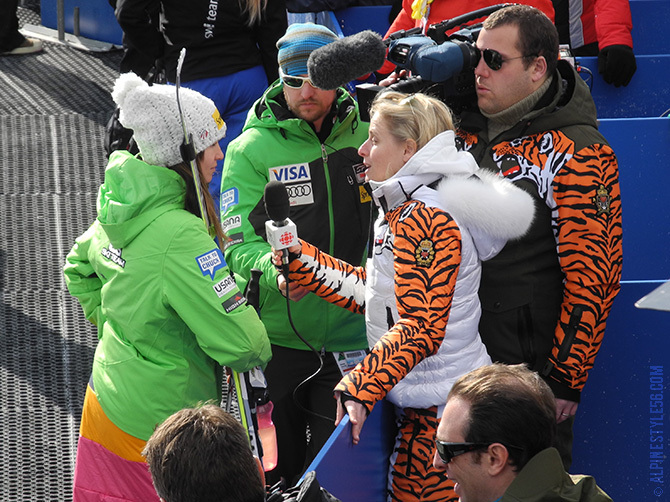 I enjoyed watching this broadcasting duo at the Alpine World Championships in Schladming, Austria. Each day they would come dressed in exquisite complementary ensembles of luxury outerwear. 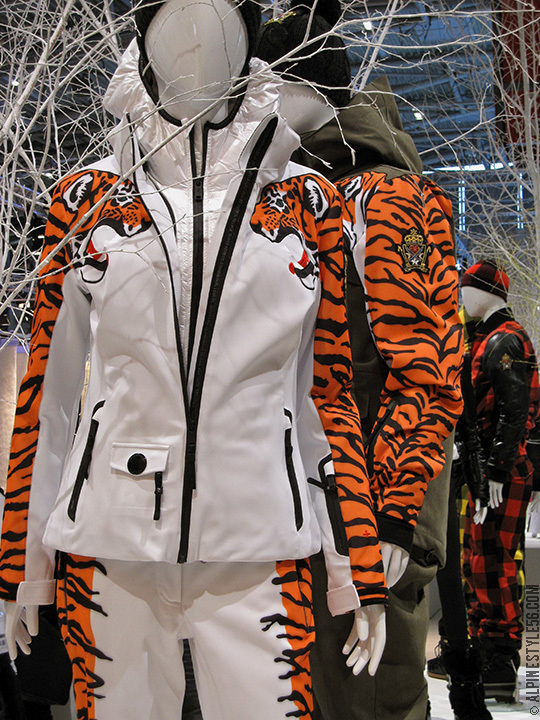 The wild snow tiger theme shown here as they interview Julia Mancuso is by Jean-Charles de Castelbajac for Rossignol – styles I had seen the winter prior at the ISPO trade show but never expected to have the good fortune to see on snow! 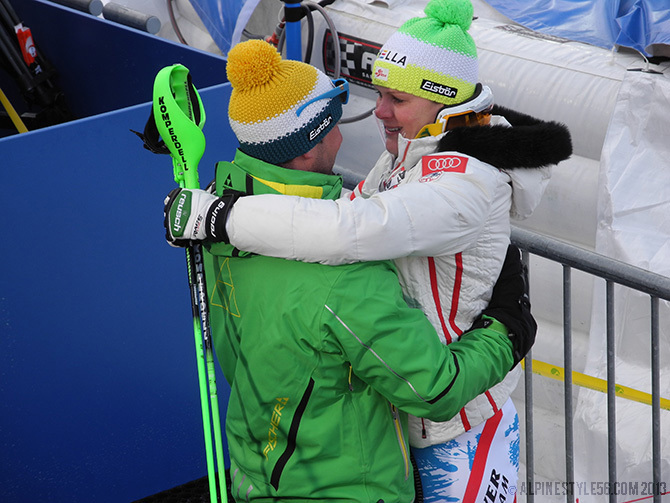 Schladming 2013: Christin Cooper with Julia Mancuso. . . 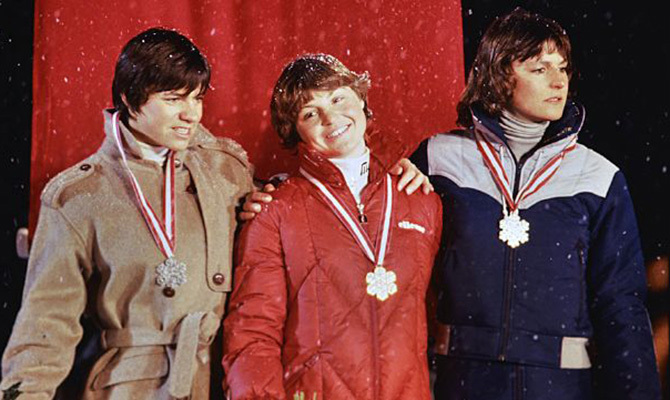 In 1982, Christin Cooper won an impressive three medals at the World Championships in Schladming, Austria: Silver in Slalom, Silver in Giant Slalom, Bronze in Combined. 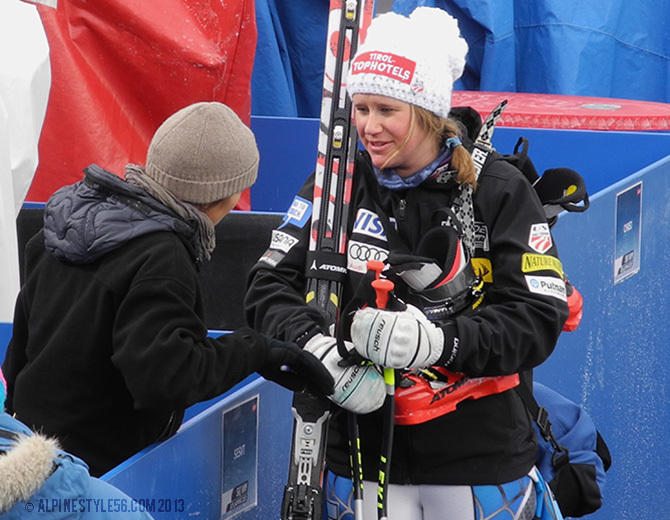 It must have been special for Christin to return to Schladming for the 2013 World Championships, this time around as a commentator for NBC Sports. 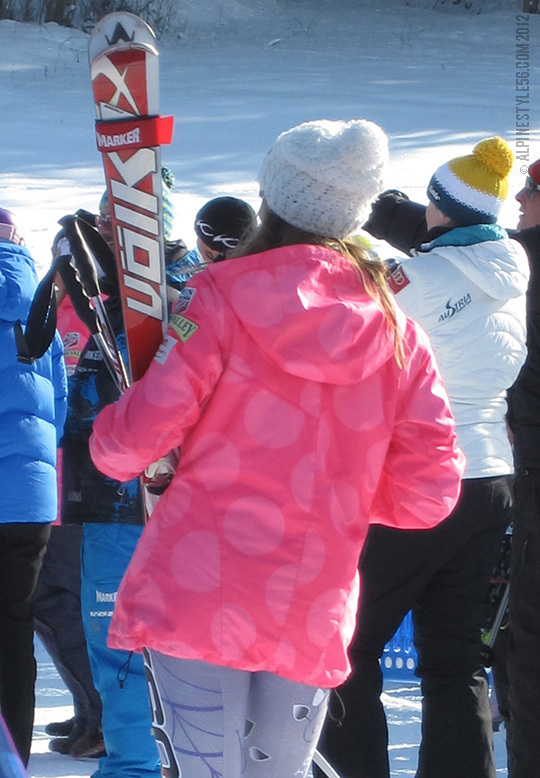 Watching the final women’s downhill practice, it appears she is a sincere and engaged mentor to the U.S. women’s team. 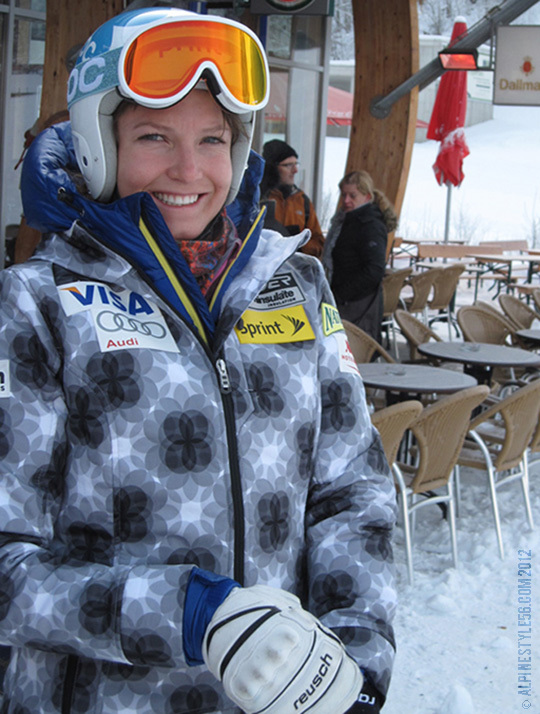 I had the good fortune of randomly meeting Christin on a walking path leading up out of the Schladming village. 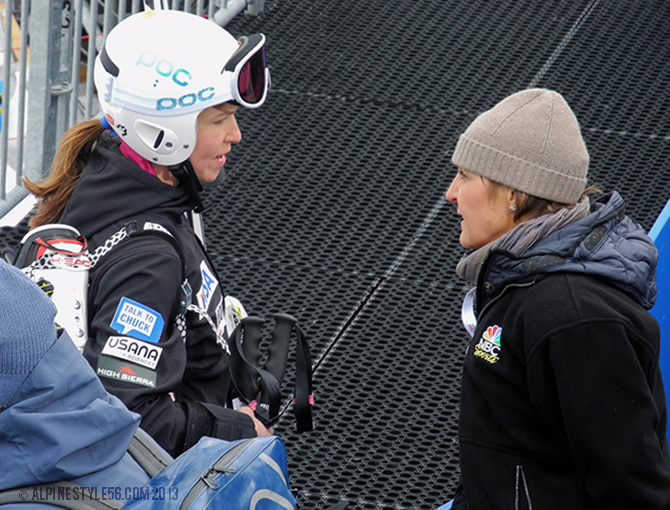 For me, this couple minute chat was a pretty big deal as she, along with Tamara McKinney, made an indelible impression on me as a young ski-racing girl in the mid-80s. I feel extremely fortunate to have had such strong and inspiring women role models at such a formative time in life. Thank you, Christin! 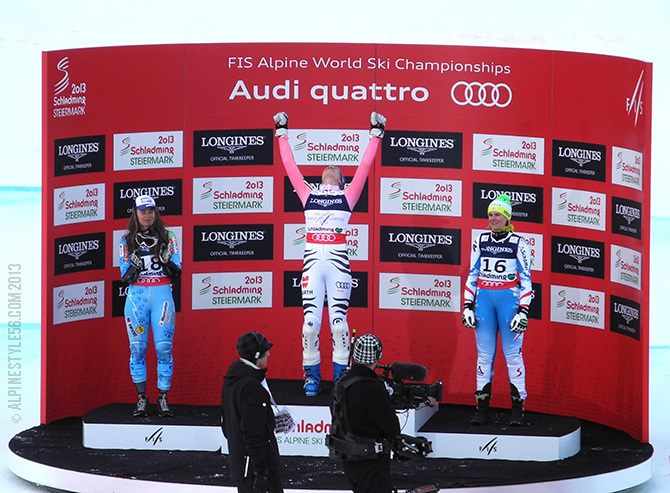 Congratulations to Tina Weirather of Liechtenstein on her first-ever World Cup win today in the Super G at Garmisch-Partenkirchen! 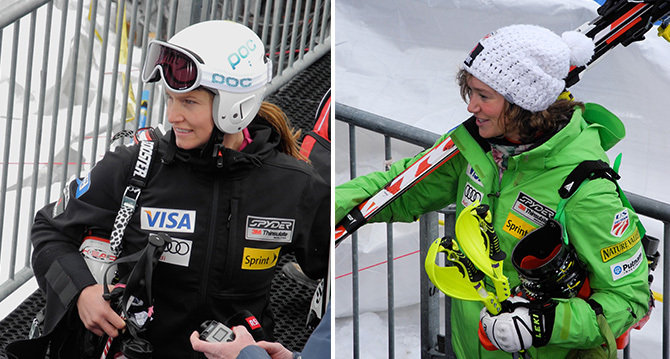 Julia Mancuso and Tina Maze tied for second place. Rooting for Julia in her quest of the SG title. 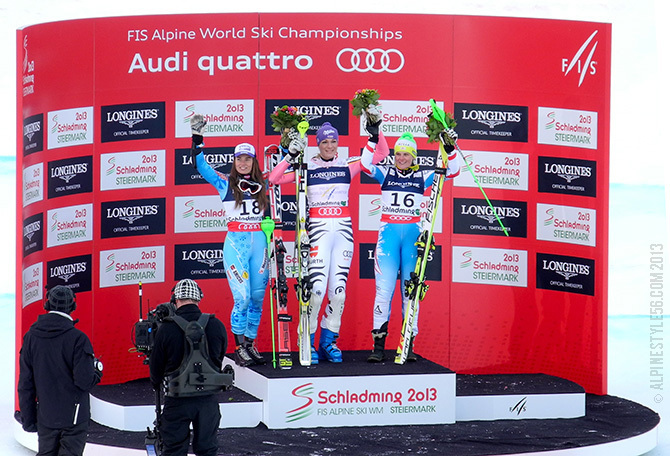 FIS Alpine Ski World Championships, Schladming 2013: Women’s Super Combined, Hoefl-Riesch Wins! x x Nicole Hosp, Austria – 3rd place, overjoyed! 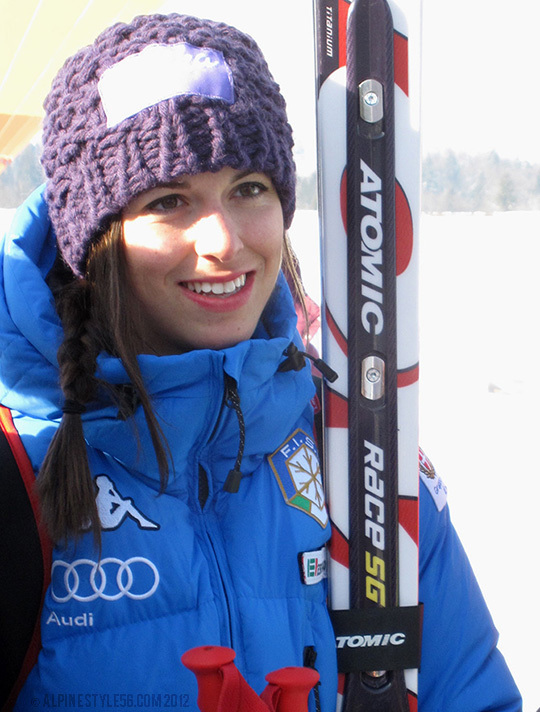 x Tina Maze of Slovenia, 2nd place. Maria Hoefl-Riesch of Germany, 1st place. Nicole Hosp of Austria, 3rd place. 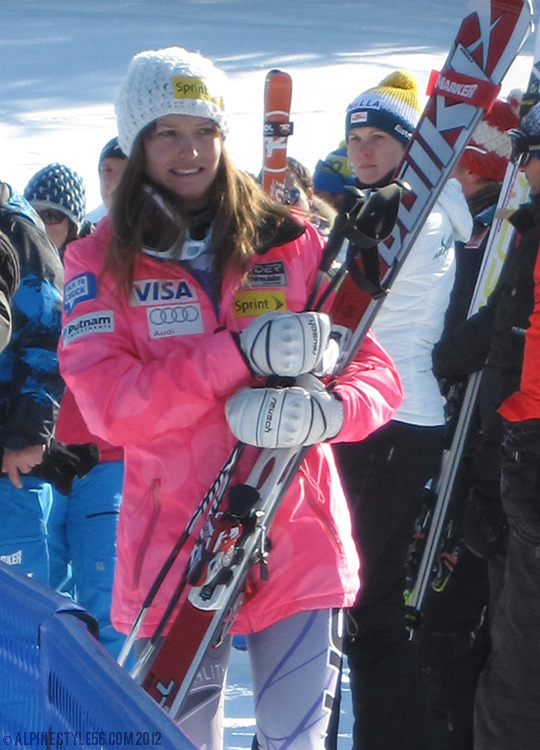 Julia Mancuso at the Kreuzeckbahn before her DH start. Laurenne Ross, ready to Shred. 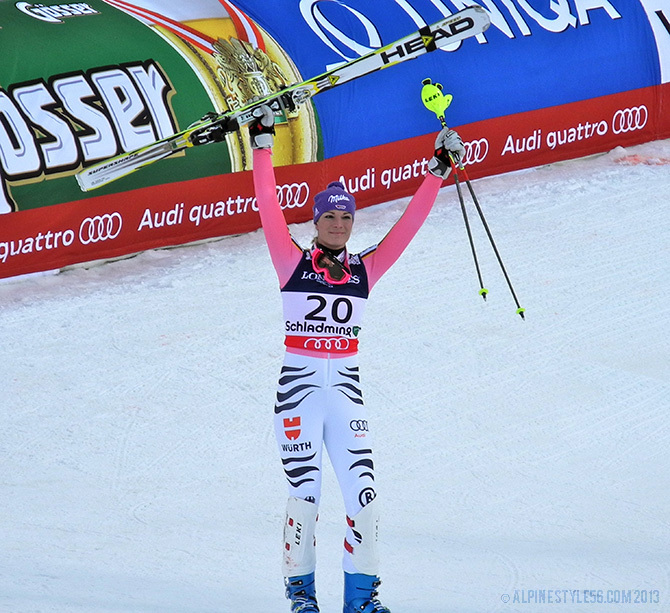 Lindsey Vonn after winning the Garmisch Downhill. 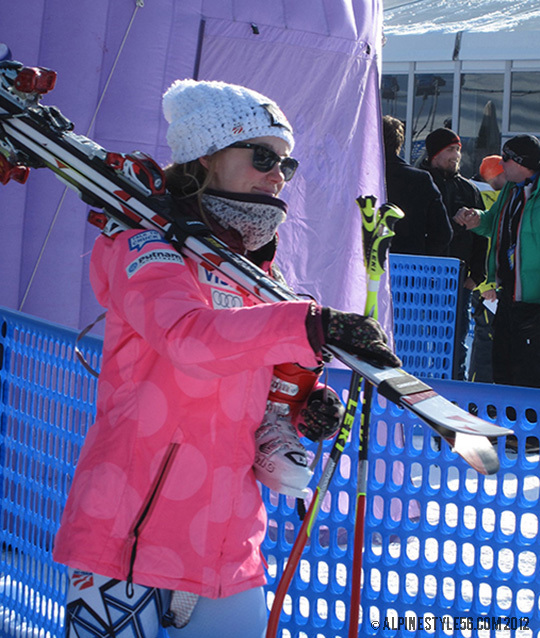 x Julia Mancuso waiting for her Garmisch Super G victory. 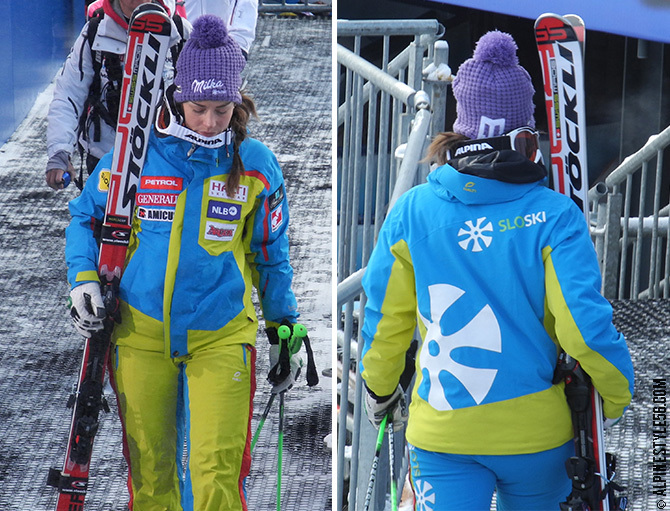 Laurenne Ross adding style with a pretty neck gaiter and gloves. It is all about the pink polka dot jackets! The vibrant color has moxie – it is both sweet and bold; the subtle pattern is enough but not too much; the silhouette is cozy and relaxed yet flattering, perfect over speed suits. The U.S. uniforms appear to have a broad range of garments and looks within the annual kit, and are creatively reimagined year-to-year, not bound to traditional red/ white/ blue Americana. As a designer, I would be interested to learn about the inspiration and athlete input that determines the creative direction, as well as see how all the pieces merchandise into a cohesive uniform system.